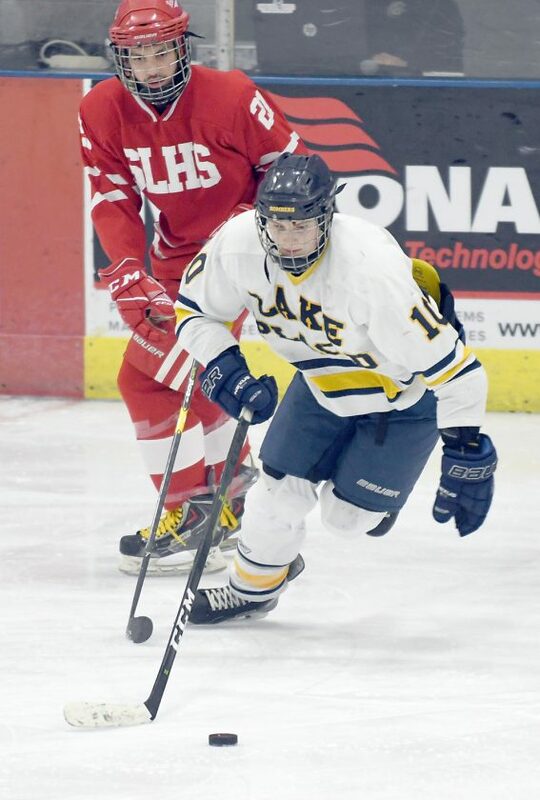 LAKE PLACID — At least for now, the Saranac Lake boys hockey team appears to be back on track. 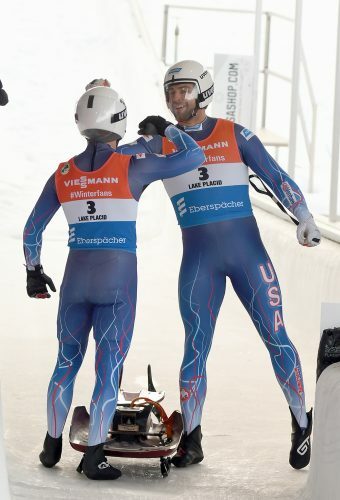 And at the same time, the road continues to be rocky for Lake Placid’s boys. The two rivals squared off for the second time in league play Thursday, and the result was pretty similar to their first meeting, ending in another lopsided win for the Red Storm. 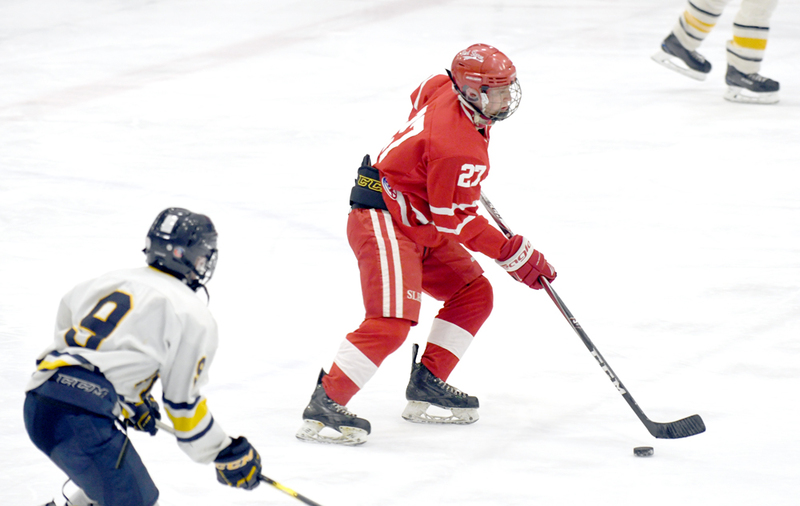 After beating Lake Placid 7-1 on home ice two weeks ago, Saranac Lake completed its Champlain Valley Athletic Conference season sweep on the road with an 8-3 triumph over the Blue Bombers at the Olympic Center. Skating on the Blue Bombers’ big ice sheet at the 1932 Rink, the Red Storm utilized its depth to win their second CVAC game in a row. 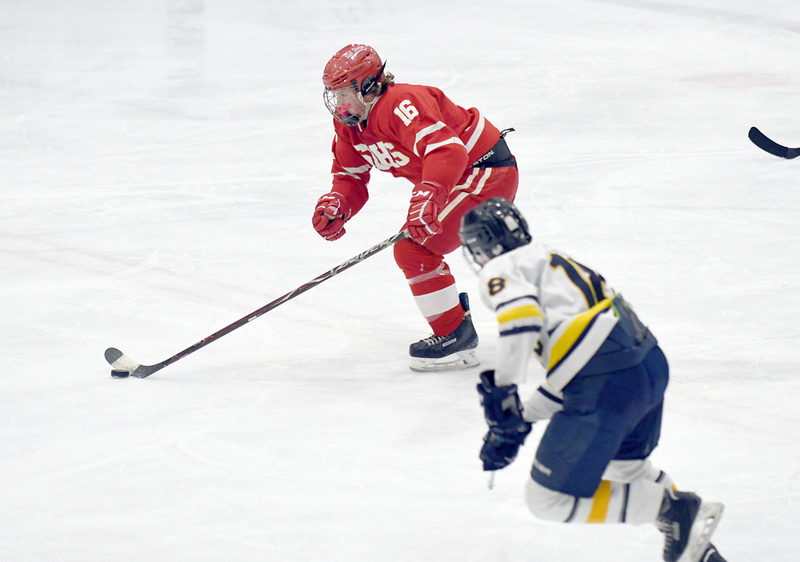 Lake Placid opened the scoring when Brendan Bullock buried a rebound just 58 seconds into the first period, but Saranac Lake responded by reeling off six goals in a row to put the game out of reach heading into the third. Both teams then found the back of the net twice in the final period to cap off the scoring. With the game well in hand, Saranac Lake head coach Will Ellsworth was able to empty his bench for most of the third period. “That first goal woke us up a little bit,” Ellsworth said. “We came out really sluggish, but our guys didn’t panic. We’re coming around. We had a somewhat healthy lineup tonight and we evened out the lines. We skated three lines the whole game, and at the end, we got our fourth and fifth liners out there, and they did their job. Rhett Darrah and Alex Dukette had huge nights for the Red Storm. Darrah finished with four goals and Dukette chipped in with a hat trick. Dylan Amell notched Saranac Lake’s other goal. Skating on Saranac Lake’s top line, Darrah, Amell and Austen Reyell combined for 12 points. Reyell, who captains the team along with Dukette, finished with five assists and Amell added two. Ben Munn recorded two assists in the win and teammates Bailey Bartholomew, Carter Sturgeon and Quin Peer added an assist apiece. The Blue Bombers found themselves in trouble before they even stepped on the ice after their top scorer, Tyler Hinckley was serving a one-game suspension. To make matters worse, the team lost another player in the first period when senior Cooper Holmes suffered an apparent broken wrist. Despite the low numbers, Lake Placid head coach Butch Martin refused to blame a depleted roster for his team’s tough outing. Instead, he singled out soft goals as leading to the Blue Bombers downfall in the game. Bullock, a freshman, made his return to the lineup after missing about a month of hockey with a knee injury. He scored less than a minute into the game to give Lake Placid a 1-0 lead, but the advantage disappeared quickly, as Darrah evened the score 3:35 into the game and then put Saranac Lake on top to stay with his second tally at the 10:23 mark. Dukette upped the edge to 3-1 with the final goal of the first period. Saranac Lake then netted three goals in the second to lead 6-1, with Dukette scoring two times and Darrah finding the back of the net once. 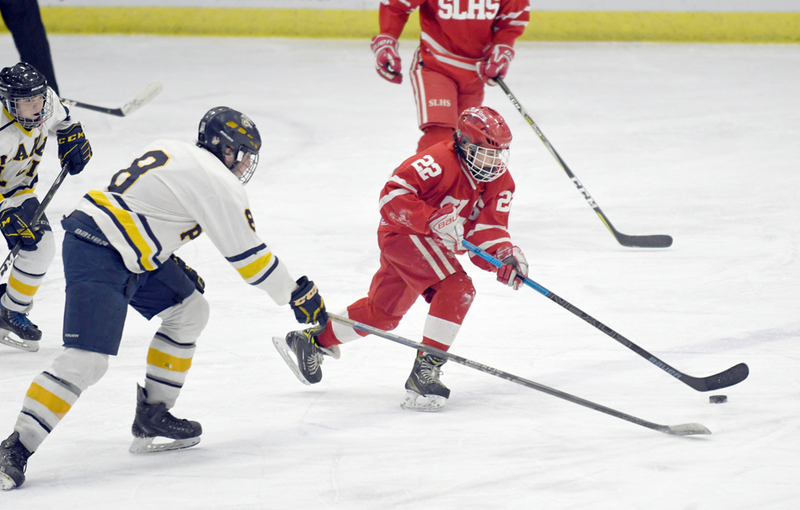 Darrah and Amell scored Saranac Lake’s goals in the third period, with Hayden Plank and Hunter Wilmot tallying for Lake Placid in the stanza. Wilmot also picked up an assist to finish with two points, and Dustin Patterson, Jarrett Hathaway, Tristan Spotts and Noble Sawyer recorded one assist each in the loss. Sophomore goalie Anders Stanton had an uncharacteristically rough outing for the Blue Bombers, allowing eight goals on 32 shots face. Bruno Freeman started between the pipes for Saranac Lake and made 20 saves. He was replaced midway through the third period by eighth-grader Brayden Munn, who gave up one goal and registered three stops in net. Lake Placid remained winless in CVAC play at 0-7 and fell to 0-14-1 overall. With the win, Saranac Lake upped its CVAC record to 4-2-2 and improved to 7-6-3 overall. 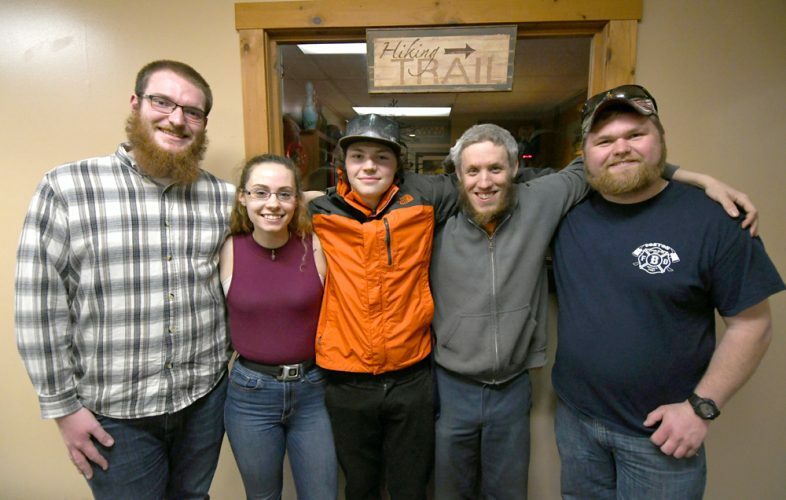 Thursday’s game was the opener of Lake Placid’s annual Winter Carnival tournament. Both teams will next face Rye. The Blue Bombers will take on the Garnets tonight starting at 7:30 p.m., with Saranac Lake and Rye then facing off at the 1932 Rink Saturday beginning at 12:45 p.m.
1. LP, Bullock (Wilmot, Patterson), :58; 2. SL, Darrah (Reyell), 3:35; 3. SL, Darrah (Amell, Reyell), 10:23; 4. SL, Dukette (Bartholomew), 11:49. 5. SL:, Dukette (Reyell, Peer), 8:00; 6. SL, Darrah (B. Munn), 9:05; 7. 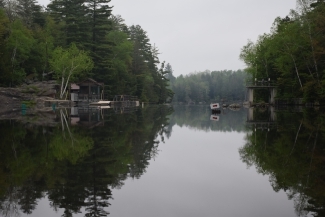 SL, Dukette (Sturgeon, B. Munn), 14:33, pp. 8. LP, Plank (Hathaway), 3:42, pp; 9. SL, Darrah (Amell, Reyell), 5:02; 10. SL, Amell (Reyell), 9:38; 11. LP, Wilmot (T. Spotts, Sawyer), 14:51. Shots on goal: Saranac Lake 32, Lake Placid 24. Saves: LP, Stanton 24; SL, Freeman 18, Br. Munn 3.